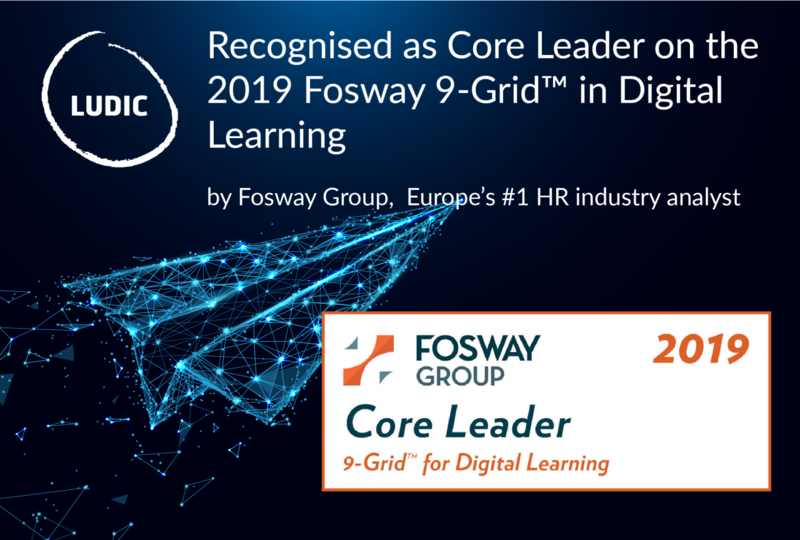 Ludic's high track record of 'ground-breaking both in scale and in quality of delivery' digital learning programmes bring recognition as Core Leader in the 2019 Fosway 9-Grid™ for Digital Learning, published January, 2019. Ludic's digital learning programmes powered by its proprietary digital platform SmartLab enable clients to provide unique learning experiences and programmes with transformative results and rapidly build capability at a global scale. David Wilson, CEO of Fosway Group commented, "The breadth of Ludic's digital learning portfolio provides its growing customer base with a range of options to cater to the modern workforce. Its position as a Core Leader reflects this and its commitment to ongoing innovation." SmartLab combines a powerful platform and methodology to make the delivery of large-scale collaboration, learning and engagement programmes simple. "It's the ultimate digital transformation toolkit to equip your business with the skills needed to thrive in a Digital world", said Garrick Jones, Ludic's Founding Partner. "It supports organisations at every step of their transformation journey from strategic alignment and implementation, to activating and engaging their people in the strategy and then enabling them to build the capability and skills needed to make this a reality and a successful shift to digital, far faster and more cost effectively than ever before", he adds. Ludic's digital learning offering, whether it is a blended learning programme, a personalised and flexible digital learning experience, a learning game or digital coaching, provides dynamic learning, using the best of digital technologies, including VR, AI, Gamification and many more. Our capability building programmes are being used by our clients around the wold not only to transform their L&D offering to digital but also because they have a proven track record for delivering tangible strategic outcomes both for the individuals and for the business. "We're delighted to be recognised as Core Leaders in the Fosway 9-Grid™for Digital Learning. We continuously invest in our experience platform SmartLab and are proud to be delivering ground-breaking programmes both in scale and in quality of delivery"said Paul Ashcroft, Ludic's Founding Partner. "Personalisation, artificial intelligence and learning analytics are the next big shift in digital learning, achieving better results for the individual, as the experiences will be even more adaptive to users' behaviours and preferred styles, while providing measurable outcomes for the business. Engaging your people in powerful and impactful learning experiences with learning experience platforms will activate your organisation's full potential. Our LXP, Ludic SmartLab is a web-based platform which also ties well together with traditional LMS tools and talent management systems that are already in place within an organization", said Clemens Hackl, Ludic's Director of Digital. Ludic remains committed to the continuous improvement of our solutions, technology and content, staying true to our ambition to enabling people to transform the way they live, work and learn. Fosway Group is Europe\s #1 HR Industry Analyst. The Fosway 9-Grid™ provides a unique assessment of the principal learning and talent supply options available to organisations in EMEA. Visit the Fosway website at www.fosway.comfor more information on Fosway Group's research and services.